This year’s Regionals meet was an unbelievable one for the Rails! In this “one day, one shot” meet to determine state qualifiers, the Rails competed in a big way to earn several spots to state! The divers started things off Thursday by qualifying two for state diving. While Saturday was the swimmers time to shine as they raced for new personal best times, podium spots and to swim at state. And all the teams in Iowa definitely brought their “A” game, as evidenced by the state cut times! The trend of faster and faster cut times continues, with several events having the fastest cut time in state history. The girls arrived early to Lincoln for their first warm-up of the day and breakfast on the road. 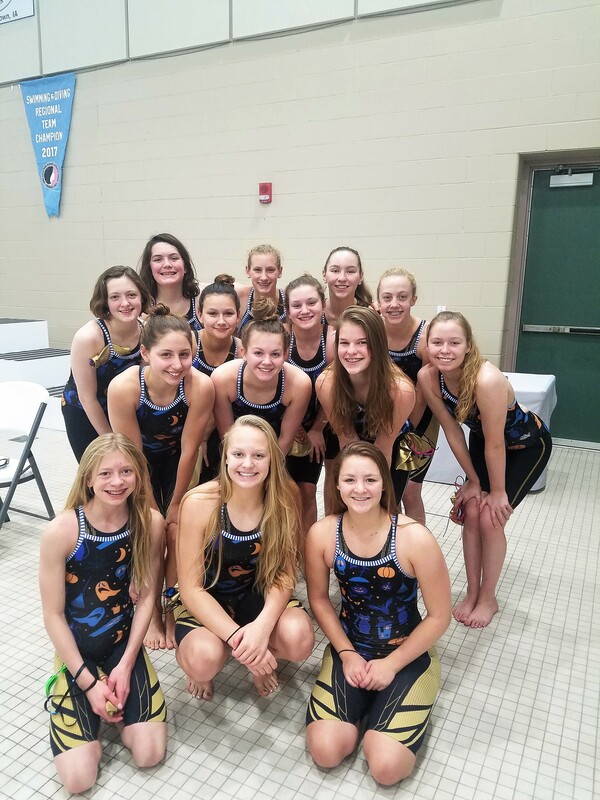 Before long, they were in the water at the Marshalltown YMCA, decked out in their fastskin suits and Halloween drag suits to warm-up a second time. The girls looked fast and focused in the water. The meet started off with a bang! The medley relay broke the school record and dropped to a 1:52.72. From there the girls just kept rolling! The distance girls dropped over 40 seconds in the 500 Free alone! Chloe Marquis set two school records in the 100 Fly and 100 Back and qualified to State in both events. Catherine Dooley moved up to 2nd All-Time in the 100 Breaststroke with her time of 1:11.24 and earned a spot on the podium. Ellie Sizemore earned an individual medal for her 500 Free swim (5th place). Plus – all three relays earned podium spots too. The Rails finished in third place overall. The meet ended with the girls having 100% time improvements, dropping around 3% as a team (over 99 total seconds! ), set 11 Top 5 All-Time records (15 this season! ), which includes breaking six school records. The Rails also earned their highest power ranking in team history of 1595 points and finished around 15th (not all teams have updated their final rankings as of publishing). Below are highlights from the meet. We’ve tried to recognize everyone’s outstanding performances. In fact, every time posted below is a personal best time for high school swimming (even if not specifically noted). The Medley Relay (Marquis, Dooley, Zaugg, Snow) qualified for State with their record-breaking time of 1:52.72! Dooley split the second fastest 50 Breaststroke time in the entire regional. Josie Helm’s 200 Free time of 2:12.83 (-6 seconds) and 500 Free time of 5:58.12 (-13 seconds) were both personal bests! Kalani Mangin took 2nd in her heat in the 100 Free and swam a new PB time of 58.23, dropping 2.74 seconds! Grace Crady dropped 15 seconds in her 500 Free to 5:40.00! Courtney Meyer and Ella Worth dropped to personal times in the 100 Back to a 1:09.60 and a 1:11.58 respectively. Below are just a few of the photos from the meet. View all of the photos from a meet on the swim team’s Shutterfly website. Just log-in. Don’t forget to check out the some tips and tricks for the State meet, including the new option to buy tickets online! Team Banquet, Monday Nov. 6th: Following the State Meet weekend, the team banquet will be held in the LHS Commons. The banquet is for all team members and their families. Baratta’s will be catering the meal and we just ask that each family bring $5/per person to help cover the cost of the meal. The team banquet is a chance to celebrate another successful season, hand out letters and team awards, while sharing off-season plans and expectations. The girls typically dress up and take a ton of pictures too.